February 2, 2016. Paris and Onward: the Path Forward to a Nuclear-Free, Carbon-Free energy future. NIRS telebriefing with Dr. Mark Jacobson, Stanford University; The Solutions Project (http://thesolutionsproject.org/) and Dr. Arjun Makhijani Institute for Energy and Environmental Research (IEER.org). Moderated By: Tim Judson, Executive Director, Nuclear Information and Resource Service. MP3 recording. January 29, 2016. Maryland's Renewable Grid of the Future. Presentations given at symposium at Johns Hopkins University in Baltimore. All files are pdf. December 1, 2015. Webinar on the grid of the future in Maryland, with Dr. Arjun Mahkijani of Institute for Energy and Environmental Research, Corey Ramsden of Maryland SUN, and Jessica Azulay of Alliance for a Green Economy; moderated by Tim Judson of NIRS. How we can build a statewide grid that can support a system run on renewables and increased energy efficiency. Powerpoint of Dr. Arjun Mahkijani, IEER. Powerpoint of Corey Ramsden, MD SUN. Powerpoint of Jessica Azulay, AGREE. August 4, 2015. New report by Germany's Prognos AG for Agora Energiewende: Comparing the Cost of Low-Carbon Technologies: What is the Cheapest Option? Concludes, based on current experience in Germany and the UK, that a reliable system based on solar and wind with gas backup is 20% cheaper than a system with nuclear and gas backup. June 30, 2015. Don't Nuke the Climate telebriefing: lessons from Japan and Germany. Featuring Amory Lovins and Tim Judson with Michael Mariotte moderating. mp3 file. June 22, 2015. Pope Francis' Encyclical on climate includes several passages highly skeptical of nuclear power as a technology, and thus as a climate solution. Excerpts here. June 17, 2015. Important new report from Institute for Energy and the Environment at Vermont Law School's Mark Cooper: Power Shift: The Deployment of a 21st Century Electricity Sector and the Nuclear War to Stop It. Describes how the nuclear power industry is seeking consumer bailouts for its uneconomic reactors while working to undermine adoption of clean renewable energy. December 1, 2014. 148 groups, thousands of individuals, tell EPA to remove nuclear power support from Clean Power Plan Proposal. Comments. Press Release. Additional technical comments submitted by NIRS. 32 organizations submitted additional substantive comments on legal and technical deficiencies in the Clean Power Plan proposal. October 7, 2014. Naomi Klein: Dr. James Hansen is wrong on nuclear power. July 16, 2014. 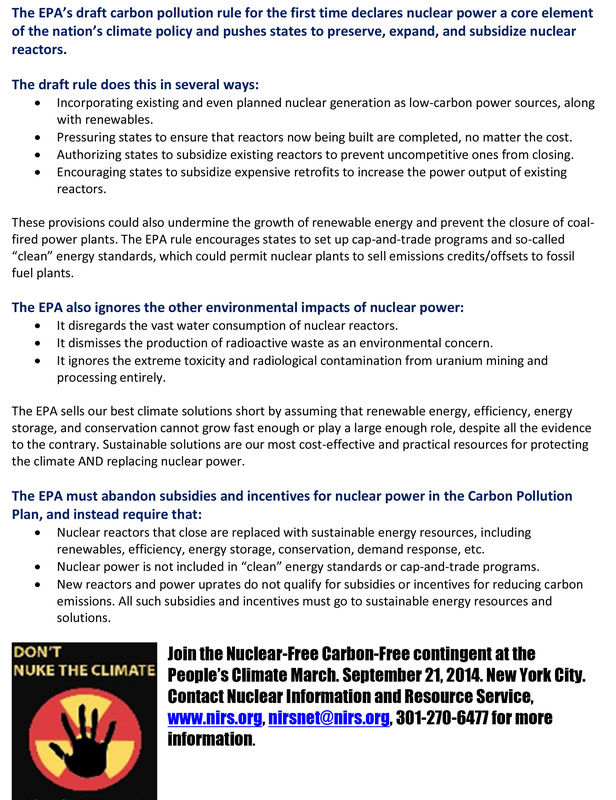 Flyer: Talking Points on nuclear power in EPA's proposed carbon reduction rule. pdf version. jpg version. June 19, 2014. Recording of last night's NIRS national telebriefing on nuclear power and climate, featuring Michael Mariotte, Hunter Lovins and Tim Judson. mp3 format. June 18, 2014. Conversation between Professor Benjamin Sovacool and NIRS' Executive Director Tim Judson on nuclear power and climate. Prepared for June 18, 2014 national teleconference on nukes and climate. mp3 file. June 4, 2014. NIRS factsheet: Nuclear Power and Climate: Why Nukes Can't Save the Planet. Two-page sheet suitable for downloading/printing on the basic reasons nuclear power is not a global warming solution and, in fact, would be counterproductive at addressing the climate crisis. June 2, 2014. EPA carbon rule offers misguided subsidies for uneconomic, aging and dangerous nuclear reactors; carbon reductions would be greater and costs lower if such reactors were replaced with renewables and efficiency. NIRS press release. February 5, 2014. Important new post on GreenWorld. Japanese scientists/diplomat respond to Dr. Hansen et al: Nuclear power is not the answer to climate change mitigation. February 4, 2014. Civil Society Institute (CSI): The Renewable Energy Transition Has Begun. Reply in Bulletin of Atomic Scientists to an article in support of nuclear as a climate change strategy, which itself was a response to Hansen et al letter and NIRS/CSI grassroots statement in opposition to nuclear. January 8, 2014. 300+ environmental and clean energy organizations urge Dr. James Hansen and three other climate scientists to rethink embrace of nuclear power--it's no solution to the climate crisis. Press release from NIRS and Civil Society Institute. Text of letter, including signers. December 12, 2013. Detailed memo from Civil Society Institute rebutting November 3, 2013 letter from four climate scientists, including Dr. James Hansen, urging environmental groups to support expanded use of "safer" nuclear power. Note: at this time, memo is still in draft form and may be revised. June 24, 2013. Professor Benjamin Sovacool (Virginia Tech) and several others rebut pro-nuclear climate scientist James Hansen's recent error-filled article in support of new nuclear. November 18, 2010: Nuclear Power: No Solution to the Climate Crisis. Powerpoint from NIRS’ Executive Director prepared for debate with Nuclear Energy Institute for Clean Air Council in Philadelphia. Explains why nuclear power can’t save the climate and discusses genuinely clean technologies that can. June 2010: Physicians for Social Responsibility analysis of nuclear power provisions of the Kerry-Lieberman American Power Act. Long version. Two-page summary. May 12, 2010: Help Stop Senate Dirty Energy Bill. NIRS Alert. May 12, 2010: 200 organizations announce opposition to Kerry-Lieberman dirty energy “climate” bill. Press release (now with 213 organizational signers). May 11, 2010. Section-by-section Congressional staff analysis of Kerry-Lieberman climate bill (may change on final release of bill). Powering a Green Planet. Interactive website put together by Scientific American that amplifies on the November 2009 cover story: A Path to Sustainable Energy by 2030, in which two California professors lay out a clear plan for the U.S. to become 100% renewable-powered by 2030.
nuclear power’s economics matter little because governments must use it anyway to protect the climate. August 26, 2009: Take Action Now for a Strong Climate Bill and Against Taxpayer Bailouts of the Nuclear Power Industry! Alert. August 18, 2009: Top 10 Reasons Nukes Won’t Save Climate. Article from Michael Mariotte, first posted on DailyKos. June 30, 2009: Tell President Obama: Don't Let the Senate Climate Bill Get Hijacked by the Nuclear Power Industry! NIRS Alert. June 22, 2009. 47 organizations, including NIRS, send letter calling for major improvements in House climate change legislation. Spring 2009: No Nukes, No Coal, No Kidding.